“Text Neck”: A True 21st-Century Ailment, or Just Another Pain in the Neck? Yes, text neck is here—a medical problem for people who spend too much time looking down at smartphones. Somewhere out there, we're sure this text went out: "OMG, my BF has TN! It hurts 24/7. Do not LOL!" Heads up! So-called "text neck"—pain in your neck, spine, and/or shoulders—can develop from hours of doing this (or of holding any position, for that matter). So this is where we’ve gotten ourselves. 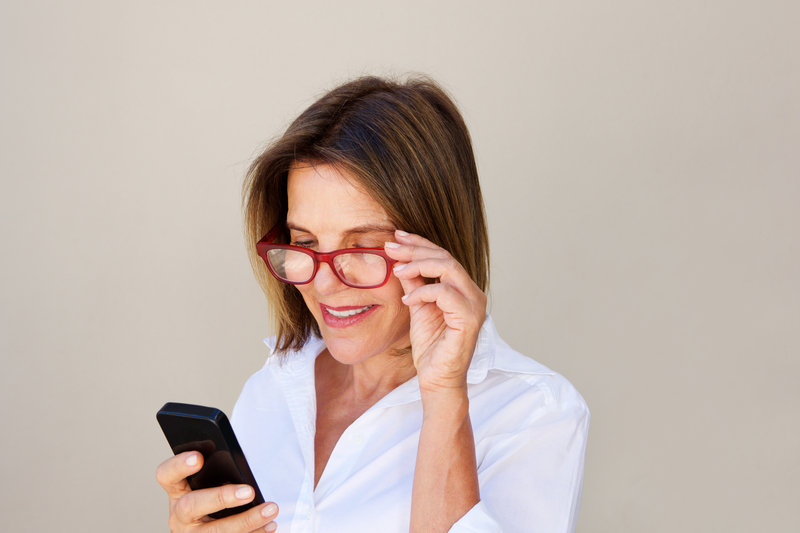 Right up there with tennis elbow, swimmer’s shoulder, and jumper’s knee is “text neck,” an increasingly common orthopaedic ailment in this digital world of messaging, viewing, scrolling, and gaming on our cell phones. It’s a pain in the neck that’s sending millions to their MDs, osteopaths, chiropractors, and massage therapists. The average adult in the U.S. spends two hours and 51 minutes a day on a smartphone—an hour more than he or she did four years ago. And isn’t likely to level off: A report issued by Common Sense Media found that 50 percent of teens feel addicted to mobile devices. A Florida chiropractor, Dr. Dean Fishman, coined the term “text neck” several years ago. Based on physical exams and x-rays of his patients, he theorized that people who spend prolonged periods of time with their heads down to view mobile devices are creating excessive strain on the cervical (upper) area of the spine. Constantly looking down at a cellphone—or any device–will cause pain in the cervical vertebrae. Dr. Fishman also said that tilting the head forward, together with gravity, increases the load that has to be supported by the neck and spine. And the more you tilt your head forward, the heavier the load—up to 60 pounds at a 60-degree tilt. That claim has been disputed by other experts, who say that our necks are made to bend forward; the position isn’t something that’s new to humans. Texting, after all, involves the same type of posture as when we read a book. This argument suggests that the problem is not the position of the head—it’s the amount of time spent in a head-down posture. Aside from scientific disagreements, how text neck develops has a common-sense explanation. Holding your head in any non-neutral position—up, down, or to the side—for several hours a day is likely to cause pain. If not classic text neck, it’s classic muscle overuse. The risk extends to people besides those who can’t resist the urge to look down at their mobile devices. Any person who sits or stands and looks down most of the day is at higher risk. Dentists, surgeons, and welders come to mind. Keep your head up and in a neutral position when using your smartphone. Avoid prolonged static postures of any kind, including staring down at your phone. Perform stretching and strengthening exercises. And (here’s the hard one) avoid excessive use of mobile devices. Dr. Fishman not only invented the term “text neck,” but he established the Text Neck Institute to conduct research and treat text neck patients. He also created a mobile app called “The Text Neck Indicator” that alerts users when they are in an at-risk/head-forward position. You can do Head Tilt exercises almost anytime or anywhere. Below are three easy at-home and at-work exercises to help you win the battle against the dreaded text neck. For more stretching exercises, see UCLA’s Stay Fit Series: Easy Exercises for Flexibility. Slowly tilt your head toward your left shoulder as far as comfortably possible. Do 3 to 5 reps, 2 sets. Slowly roll your head back and hold for 3 to 5 seconds. 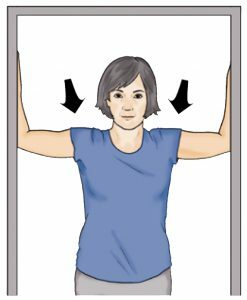 Shoulder Doorway Stretches will help keep the muscles in your neck and shoulder loose and limber. Stand in front of an open doorway, feet staggered, arms raised, upper arms parallel to the floor. Place your palms against the sides of the doorframe and lean forward. Hold for 20 to 30 seconds and relax. Do 2 to 3 reps, 1 to 3 sets. Ice or Heat? For Back Pain, It Depends? 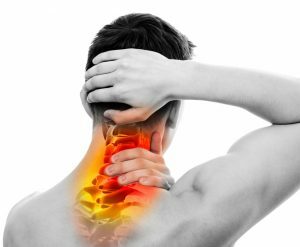 back pain, back pain treatment, heat for back pain, ice or heat for back pain, massage, muscle, neck pain, pain, pain treatment, pains, posture, report, tennis elbow, upper back pain. How is this neck pain different than the one created by reading books? I am 64 years old and have read books all my life. Bending my neck to read books (or kindle, now) looks the same as someone looking down texting. I have had neck pain for several years but refuse to give up reading. I am trying to hold the book up more so my neck doesn’t bend, but not easy to do with a hardcover book. I thought you might be interested in this article on https://universityhealthnews.com: "Text Neck": A True 21st-Century Ailment, or Just Another Pain in the Neck?